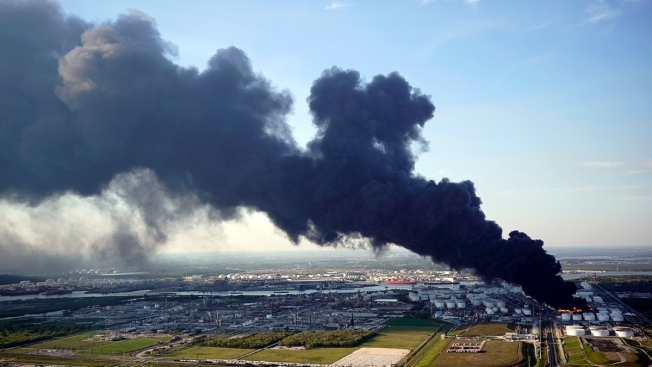 In this March 18, 2019, file photo, a plume of smoke rises from a petrochemical fire at the Intercontinental Terminals Company in Deer Park, Texas. Organizers say an annual event marking the Battle of San Jacinto and re-enactment of the fight for Texas independence has been canceled amid continuing cleanup from the Houston-area chemical plant fire. The Texas Parks & Wildlife Department says the San Jacinto Battleground State Historic Site in La Porte remains closed and the April 21 ceremony is canceled. The Battleship Texas site also remains closed. The April 21, 1836, Battle of San Jacinto was a major victory for Texas seeking its independence from Mexico. Organizers say an annual event marking the Battle of San Jacinto and re-enactment of the fight for Texas independence has been canceled amid continuing cleanup from a Houston-area chemical plant fire. The Texas Parks & Wildlife Department says the San Jacinto Battleground State Historic Site in La Porte remains closed and the April 21 ceremony is canceled. The Battleship Texas site also remains closed.